A confession: I am a long-time fan of video games, and as such, I'd say I have pretty high expectations when it comes to gameplay, mechanics, and animation. The latter is particularly made me pretty skeptical that I'd enjoy Minecraft, a game that lets you build worlds out of blocks. A world built out of 3D blocks is, well, blocky, and I couldn't imagine that I'd find much pleasure -- aesthetically or otherwise. "Teachers who grew up playing games are only now hitting a stride in their careers. Many will naturally look to games as a way to engage their students." But I was wrong. Minecraft's visual simplicity belies what is a completely open-ended and therefore terrifically complex world. And the best of that world: it's up to the player to design. Minecraft is what's known as a "sandbox" game, giving players almost complete freedom to build within it. And that's what makes it great for the classroom. Joel Levin, a computer teacher at Columbia Grammar and Preparatory School uses Minecraft with second-grade students. Minecraft can be played in single-person or in multiplayer mode, and players can join public servers, or in the case of Levin's class, the game can be run on a private server. By doing the latter, Levin is able to install certain add-ons and mods suited for his students (giving him the power, for example, to place and delete blocks from a distance). But the students do play the multiplayer version, entering Minecraft's brick-building world together and, together, working through various projects that Levin assigns. 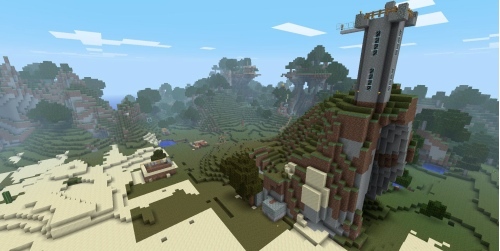 This combination of control through a private Minecraft server and the open-endedness of the game is, in Levin's words, "exactly what is so appealing to me about Minecraft as a teaching tool. It's so open ended and extensible. I really think of it more as a canvas than a game. I'm able to construct these elaborate experiences, settings, and stories for the kids to move through. Rather than having to shoehorn a lesson around a game, I'm able to think about what I'm trying to teach and then design an entire world around that." 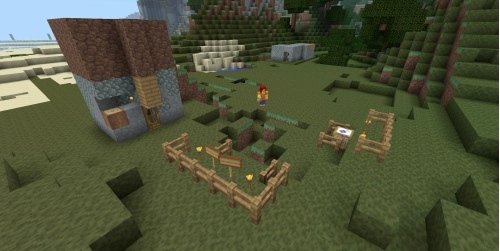 In some ways, much like Minecraft, Levin's experiment using the game in the classroom was initially just as open-ended. He says he had no clearly defined goals, although he knew that there would be lessons -- both technical and social -- that he could impart. After running the game with his students for a while, "I'm now trying to define real goals. I want the kids to learn to be responsible, self-reliant, innovative thinkers who are comfortable using technology to interact and create. I want them to realize that how they treat others in a game, online, or in the physical world is all really the same thing." As a computer teacher at a school with a lot of technical resources, Levin admits that it's "pretty easy" for him to integrate games into his curriculum. Not every classroom or every teacher is in the same position. But Levin believes that "as time goes by, games will creep into the classroom in more and more ways. Teachers who grew up playing games are only now hitting a stride in their careers. Many will naturally look to games as a way to engage their students." You can read Levin's blog The Minecraft Teacher and follow him on Twitter.